I worked with Practica Foundation as a Project manager, and was involved in the research and development of new solutions for water catchment. 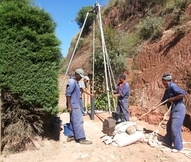 Supported by Practica headquarter team, I contributed to the works on the design, tests, assessment and dissemination related to the improvement of manual drilling, rainwater harvesting and other water supply technologies. I am an analytical person who works structured and systematic. I am a very flexible person able to work in groups. Interdisciplinary thinking is an important aspect of the work I am doing at the moment. I am curious and eager to learn new things and new challenges. Manual drilling into my smartphone!!!! !